toward improving your dental & overall health. 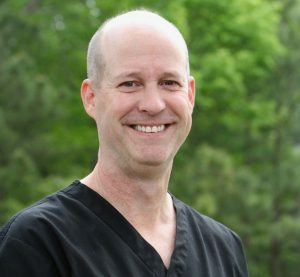 Home » Our Dentists » Dr. Douglas Overstreet Jr.
Douglas Overstreet attended Virginia Tech and graduated with honors from MCV/VCU in 1992. He is a member of Omicron Kappa Upsilon, the Richmond Dental Society, the Virginia Dental Association, and the Spear Study Club. He is also a participant in Mission of Mercy projects and Donated Dental Services. Dr. Overstreet has lived nearly his entire life in Richmond. He married Dr. Susan Richardson- Overstreet in 1991. They have a daughter, Cameron, a son, Carter, and a chocolate lab, Kodi. In his spare time, Dr. Overstreet enjoys college athletics, traveling, hiking & is passionate about photography.